The City of Toronto is the largest of Canada’s vibrant urban centers. It is the hub of the nation’s commercial, financial, industrial, and cultural life, and is the capital of the Province of Ontario. Toronto is one of the most multicultural cities in the world – a city where more than 150 languages are spoken every day and 50% of its residents are born outside of Canada. A true city of the world, Toronto is a large cosmopolitan city. You’ll find a vibrant nightlife, world-class festivals, stunning architecture, great museums, galleries and theatre, various restaurants and shops, and interesting work opportunities. It is also home to hundreds of ethno-cultural organizations including professional associations and community centres. Take a bite out of GreekTown by visiting one of its many restaurants, lounges, cafes, or bakeries. Enjoy traditional Greek cuisine, or other multi-ethnic dishes, that offer a variety of tastes that will tantalize anyone’s taste buds. Come to the Danforth and enjoy a meal with the family, have a cocktail or two with friends and co-workers, or take a little bit of GreekTown home. Greektown Taste of the Danforth, sponsored by Pilaros, is one of Toronto’s signature events, showcasing the best of Hellenic food, culture, and music our multicultural city has to offer – from souvlaki to mezes, authentic Greek music to interactive children’s games! Gerrard India Bazaar is the largest marketing place of South Asian goods and services in North America. With over 100 shops and restaurants which represent regional diversities of South Asian culture, food, music and products, this slice of the Indian subcontinent offers a wide selection of services and products exhibited in an exotic display of sights, sounds, tastes and aromas. The array of merchandise available here helps South Asians maintain ancient cultural and religious traditions, and keep in touch with the contemporary lifestyle of the Subcontinent. 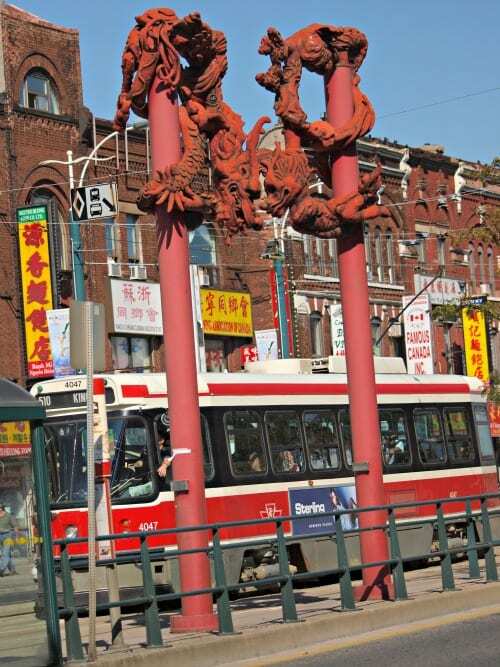 One of Toronto’s Chinatowns is located on the corner of Spadina and Dundas Street West. The area is home to a number of authentic Asian restaurants, shops and fruit markets. This is the largest of five Chinatowns in Toronto. The second largest is located in the Broadview/Gerrard area. Toronto’s Chinatown district is one of the largest in North America. In addition to the colourful signage and storefronts, attractions to visitors include the many authentic Chinese restaurants in the area as well as many ethnic shops selling herbal remedies, fresh produce, meats, baked goods, videos, books, arts and crafts, and more. Two shopping malls in the immediate area have many stores and services catering to the Chinese community. Chinatown Toronto street signs are in both Chinese and English. Adjacent to Chinatown and bordered between College and Dundas streets, all the flavours of the world are here at Kensington Market. Cheese and pastry shops, delis, clothing and dining options from Jamaica, Mexico and Hungary to Ethiopia, the Caribbean and Lao and all points in between make for worldly dining and shopping options. Little Italy, with its intimate European atmosphere, has some of the best Italian cuisine this side of the Atlantic. Walking down the College strip, you can smell the scent of authentic Italian dishes being prepared for the crowds of people on the patios. Italian cuisine has long dominated College St. and while many changes have come and gone, it still remains the main dish of the street. With some of the best patios, menus and people in the city, why not lose yourself and have a “taste” of Little Italy in your own backyard! Little Italy has created its own clubbing district within the Downtown core in the past couple years. The strip transforms overnight, with beautiful young people flooding the streets, switching between local bars to martini lounges in a matter of minutes. Shopping on College St. was originally aimed for the local Italian community, but as the area bloomed, trendy boutiques have popped up all over. With everything from specialty shops, a record shop and trendy book stores. West of the Annex, between Markham and Christie Streets, lays Koreatown. Also known as Little Korea, the small stretch along Bloor has a great mix of affordable Korean eateries catering to both the local Korean-Canadian community, hungry students and other intrepid souls who dare venture west of Honest Ed’s. The joy of Koreatown lies in the process of discovery – figuring out the best place to buy a huge tub of kimchee, sampling pork bone soups, comparing bibimbaps or debating the merits of indulging in freshly made walnut cake versus the alternatives a few blocks south in Little Italy. When night falls, it’s not only time to chow down, but also seek out one of the many local karaoke bars. Little Portugal, stretching from Bathurst St. to Dufferin St., serves as the historical core of Portuguese settlement in Canada. One of the most visible ethnic neighbourhoods in Toronto, Little Portugal celebrates the identity of its roots with shops that specialize in regional cuisines, baked goods, ceramics, fabrics, and even custom furniture and fabrication. Home as well to locations of two major rival bakeries, Nova Era and Caldense, Torontonians flock to sample specialties such as the Pasteis de Nata, a Portuguese custard tart. A wave of restaurants, galleries, and clothing shops have entered the neighbourhood in the last ten years, diversifying the image of the area and reflecting the expansion of the Queen St. West neighbourhood up Ossington Ave. There is a strong Eastern European presence in this neighbourhood which is bordered by Bloor Street, the Humber River and High Park. Shops, cafés, bakeries and delis reflect a Ukranian, Lithuanian, Macedonian, German, Polish and Bulgarian heritage. August brings the Ukranian Festival complete with a parade, music, dancers and cuisine native to the country. The undeniable Little Poland of Toronto, this district is located east of High Park and features a mix of new and old, including traditional Polish butcher shops, historic cultural venues, fine restaurants and services. The vibrant neighborhood is also home to the annual Roncesvalles Polish Festival. West Queen West is gallery central with some of the city’s most cutting-edge galleries dotting the street-scape from Trinity Bellwoods Park to Dufferin. Anchored by the nightlife and cultural destinations that are The Drake and Gladstone Hotels, this neighbourhood oozes creativity, community and fun. Not to be overlooked are hidden gems like Julie’s Cuban and Luna Cafe up Dovercourt or the burgeoning South Ossington strip. Church Street and the area around it has been familiar to the Toronto gay community for many decades. Prior to the 1970s there had been an underground gay scene centered around various bathhouses and bars around the city that were not exclusively gay establishments and were mostly catered to the male population. A strip of gay bars opened along the street and many LGBT people rented apartments, joined residential co-ops or purchased condos close to Church and Wellesley. The area became what it is today, a safe and progressive friendly environment where people could not only be open but celebrate the very nature of their sexual orientation. It’s estimated that as many as 80,000 Aboriginals live in the Greater Toronto Area. That’s a population about the size of the City of Niagara Falls. Toronto is home to the oldest Aboriginal friendship center in Canada – the Native Canadian Centre of Toronto, established in 1951 as the North American Indian Club. The Centre welcomes the local community, including guests from across Canada and offers a variety of programs and services. Thank you Mary Jo! Looking forward to exploring Toronto. Cannot believe I havent made it up there sooner. Looking forward to exploring Toronto – have passed through so many times, but to actually spend some time on the ground with a group of fellow bloggers – can’t wait! I’m looking forward to going where the TTC can take me. I’m hoping that a map and a bus ticket will take me far. I have lived here all my life and I am always surprised that these lists seem to miss the Islands – beautiful parks, bike paths and views back to the city skyline – all from one ferry ticket – walk east from the TBEX site to the docks!